Looking for private in-home or in-studio Music Performance lessons? Our Anaheim teachers are ready to get you started. Find your teacher today! and eager to learn more. Alex is very passionate about music and other art forms. He quickly evaluated my strengths and weaknesses. He seems to detect a certain talent that I possess and wants to help me reach my potential. I was very impressed. Great with my kid very patient ...and fun! I have taught Rock band in Schools and Privately. Bring it all together. I also teach stage presence. I have been singing and studying voice for over 25 years since I was a child! I hold a BFA from NYU's Tisch School of the Arts. I have been lucky enough to study with some of the top teachers in the country and now I bring the experience I have gained directly to you! I am proud to share my student's vast array of musical successes. From being cast on GLEE to being accepted into prestigious performing arts academies to conquering the Karaoke scene, my students continue to motivate and inspire me. Music brings me immense joy, especially singing and I want the same thing for you! We start each lesson with proper breathing technique, the cornerstone of all vocals. We move on to vocal exercises to condition the voice. Then we work on the songs that you are eager to sing! doing vocal warm ups and conditioning exercises. Students that play other instruments and accompany themselves when performing (such as a guitar) are encouraged to bring that instrument to their lessons. We will work on proper breath technique, vocal conditioning, resonance, identifying and expanding your range, note sustain, power and vocal support. I will customize every lesson to suit your needs. 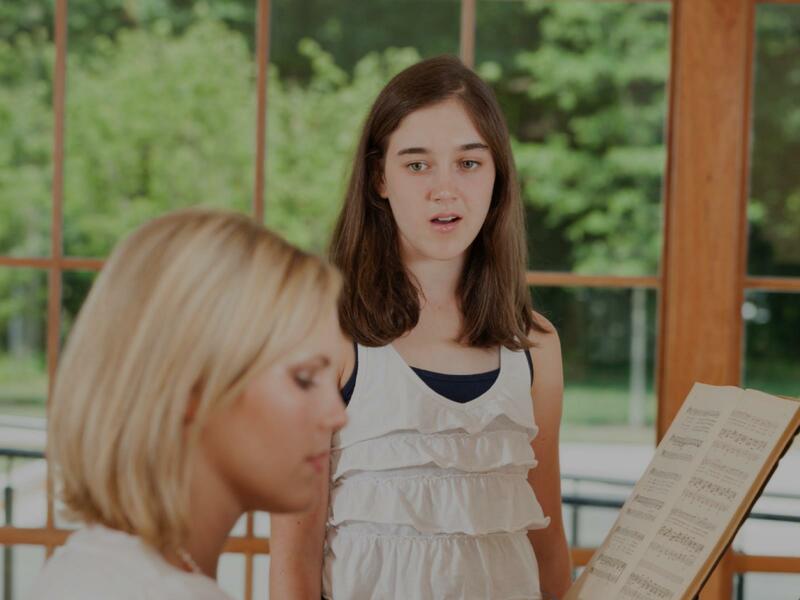 With proper breathing and vocal technique under your belt you can sing any style of music you love, sing to a roomful of people and feel your confidence grow! Stephanie is always kind, always supportive, always encouraging, and most importantly, she always knows exactly how to challenge me. I've been taking lessons from her for over two years now. Since the first lesson, my range has expanded and I've grown more confident in my ability--especially in trying out new styles/genres. It's an added bonus that she's flexible with my busy and ever-changing schedule! I would highly recommend her to students of all levels. Stephanie is an AMAZING vocal coach. Her approach is so tailored to me as an individual singer, and she is always incredibly supportive as she motivates me to work my hardest. Stephanie has helped my voice grow tremendously, expanding my range both from the bottom and the top. She has also helped me work on important dynamics of my singing, preparing me for various auditions and performances. I look forward to every lesson, as I know I am getting the best training and an opportunity to spend time with a kind, hilarious, and amazing person! Stephanie is a wonderful teacher with the most positive attitude! I've been singing with her for over a year now, and I can really see the growth I've accomplished under her careful guidance . She has great understanding of all the different styles of music that I like to sing. Most importantly, she makes me feel at ease in her presence. I would highly recommend Stephanie as a vocal teacher for a person of any age. When studying music with me, you can expect a full education and fun time learning a variety of: songs, genres, techniques, improvising, harmony, music theory and how to craft your very own songs! My Name is Mike, I'm a touring/session musician and music teacher from LA that specializes in teaching (but not limited to): Guitar, Bass, Piano, Songwriting, Improvising, Arranging, Song Production, Audition Prep, Sight Reading, Composing & Music Theory. I'm a graduate of Berklee College Of Music where I earned my BA in Film Scoring & Guitar Performance. Whether you want to follow a hobby or a passion in music, my lesson plans are tailored to fit the goals of each individual student so they can receive a personalized comprehensive musical education that includes necessary musical skills combined with their specific interests. Look forward to meeting you and getting started! Mike is an amazing teacher and a super talented musician! He's incredibly knowledgable, patient, and encouraging. He made me feel comfortable from the very first lesson, and every week I look forward to learning more from him and improving my guitar skills. I highly recommend Mike as a guitar teacher. Mike is a fantastic teacher who is knowledgable, kind and patient with my sons. He has a very easy-going teaching style which allows them to feel at ease and more ready to learn. I highly recommend him as a piano teacher, and I have also heard from friends that he is an excellent guitar teacher. Mike tailors every lesson to my skill level and needs on any given day. He always leaves me with something new to work on. He is sensitive to my musical tastes and often suggests songs and chord progressions he thinks I will enjoy practicing. Mike is a talented player and teacher, with a deep appreciation for the many styles and genres of guitar playing. A lesson with him feels like jamming with a friend. I highly recommend him as a teacher. I studied Audio Engineering and Vocal Performance at MI since I was 15 years old. Music became my passion and that's why you'll love this class. They are all customized and all ages welcome. I'm bilingual (English and Spanish)and I teach an Italian technique named Bel Canto. My voice was completely different before learning it, it felt weak and not good enough. Now it's completely different, it's fuller and powerful. You want that power in your voice, singing becomes more fun, no stress about those runs or high notes. This technique helps you getting to pretty high notes without even struggling and I'll also teach you the essentials of songwriting. My classes are fun but still pretty serious. My goal is to make your voice sound killer. Let's prepare you for that audition, that concert, that recording session. You'll feel different, you'll be 100% more confident. Like I always tell my students: DO IT OR DO NOT, THERE'S NO TRY. ging, creative and really get to the core of what you need to work on as a singer/performer, in a safe and comfortable environment. I always leave feeling inspired and very emotionally connected to my music. Jan is very genuine in wanting to help her students achieve success. I highly recommend working with Jan!" s so much fun. I highly recommend her as a teacher!" lous , trustworthy person and you should sign up for lessons immediately !" Los Angeles, CA teacher: Lilia B.
alking me step by step how she gets over her nerves before a performance. Sloane is the go-to instructor for anyone looking to become more comfortable with music. 100%!!! :)"
Los Angeles, CA teacher: Sloane F.
"Jessie is very pleasant and my daughter enjoyed her first class and looks forward to the next one!" Los Angeles, CA teacher: Arlette C.
ing lessons to me! He helped me on changing my strings and gave me lessons on proper technique on playing the bass!" Los Angeles, CA teacher: Daniel M.